Begin by kneeling in front of ball, allowing 3-4 feet of space in front of the ball. Keeping the ball close to your thighs, lay on top of it and walk hands forward till your upper thighs are touching the ball. Continue to walk hands forward until ball is slightly below your knees. Hands should be shoulder width apart, core engaged, back in a straight line, and legs together for better stability. Take a deep breath to start, then exhale and lift the R heel up towards the ceiling as you balance on the ball. Inhale as you return slowly back to ball and then exhale and lift the L heel up. Continue to alternate legs for desired number of reps.
Kneel with ab roller in front of knees – hands on handles. Inhale while slowly rolling wheel forward – keep weight evenly distributed between handles. Do not allow lower back to sag throughout forward motion. Exhale and reverse motion keeping back straight and core engaged. Inhale while slowly rolling wheel forward and left. Repeat desired number of reps, switch to right side. Attach anchor at bottom of door. Attach both ends of desired band combination to 1 handle. Facing away, lie on back 1-2 feet from door with knees bent and feet flat on floor – hip distance apart. Grab handle with both hands and extend arms straight up over chest/collarbone. Begin with a deep breath – exhale and lift head/shoulders while pushing band forward. Inhale and return to start with control. Insert anchor midpoint in door near handle. 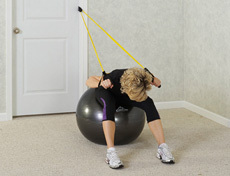 Position stability ball 1-2 feet away from door. Sit on front edge of ball with back towards door and grab handles, one in each hand. Position hands by head, with elbows bent and pointing forward. Make sure feet are at least hip distance apart, or wider, for a good base of support. To start, inhale and lie all the way back until your mid back is touching ball. Exhale, engage core, and sit up tall back to start position. Sit on top of stability ball. Walk feet forward so that ball moves to a position at the small of your back. Press feet firmly in ground, hip distance apart or wider for better stability. Place both hands behind your head (or crossed over chest to make it easier). To start, tilt pelvis forward, and begin to raise your upper body curling in a forward motion and squeeze your abs. If your hands are placed across your chest, curl in a forward motion until your elbows reach your upper thighs. For safety, always keep your chin away from your chest so that your head, neck and spine stay in a neutral position throughout the movement. Inhale and release back to start, getting a stretch in the abs. Walk feet forward so that ball isat the small of your back. To start, take a deep breath and exhale as you raise your upper body up and forward, until you’re sitting up tall with back straight. Always keep your chin away from your chest so that your head, neck and spine stay in a neutral position throughout the movement. If your feet slip, place them in front of something stable like a wall. Position hands by head, with elbows completely bent and pointing forward. Exhale,engage core, and sit up tall back to start position.